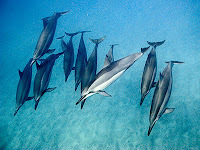 I got to swim for an hour this morning with 14 spinner dolphins who were in sleep mode. Dolphins can NEVER SLEEP. I am so glad that I am not a dolphin. I love to sleep. Since dolphins have to come up to the surface to breathe, their breathing is always a conscious choice. It is not a reflex action like it is with us, so they must be awake to breathe. Instead of sleeping, they go into a zoned-out rest state, kind of like how I drive on an interstate highway through the desert. They kind of pay attention, but mostly go through the motions without really thinking about it. They usually gather with friends in shallow clear water with a sandy bottom so that no predator can sneak up on them. Then they slowly swim in large circles. Because of their defensive posture while resting, they don't allow unknown creatures to get too close. At least that is my excuse for not getting better photos or video. Click HERE or below for the video of today's encounter. what a charmed life you lead. Thanks for the pics.